Fairgreen Farms has 3 fields devoted to the production of Blueberries and during the picking season which is around mid July to Mid September the public are welcome to come and pick the fruit 6 days a week excluding Sundays. The bushes are tall and do not have any thorns, this makes picking an easy and enjoyable activity. The bushes are grown in rows, separated by grass strips allowing easy access. Wheelchair users have managed picking on the field conditions which compare to the grass of a playing field. 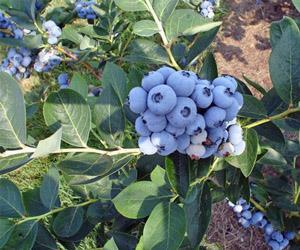 In addition to picking your own fruit there is often ready picked blueberries and blueberry jam available. Because the harvest season is at the mercy of the weather it is worth checking the www.blueberrypicking.co.uk website to confirm the harvest is ready. Outside of the harvest period, the farm is not open to the public. We charge by the kilogram for the blueberries picked (currently prices are under review we expect to be reducing them from last season). The price will be displayed on the web site www.blueberrypicking.co.uk before the picking season begins. The farm is located approx 2 miles from the Hardwick roundabout just outside King's Lynn. The Hardwick roundabout is the junction between the A10, A149 and A47. From the roundabout travelling on the A47 towards Swaffham, Norwich direction after approx 1 mile you will see the first road off tot he left. Take this road and after 0.5 mile the farm entrance is on your left.